Since Valentine’s day is coming near, Lil P wanted to make a few cards for her “Bestttttttt” friends. Luckily for us, my cousin had got Lil P these gorgeous Set of four -Paint Dab Markers from the US of A. Cut out a heart shape in the centre of the rough paper to form a stencil. Place the stencil in the middle of your 6×6 card. Dab the centre of the stencil with yellow Dots. Add random dots in the middle. 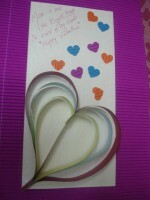 We added ” You Colour My World” inside the card. 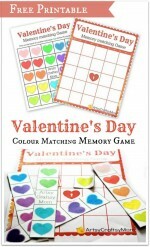 We have a lot of other valentine’s day posts that have been quite popular..
Free Printable Valentine’s Day Memory Game – Easy to Print, Fun to Play & improves memory ! Raising a loving child – Simple activity to teach your child gratitude & appreciation. Valentine’s Crafts- Dotty Heart & Heart flowers – Another Dot to dot project. Improves Fine motor skills for young kids. 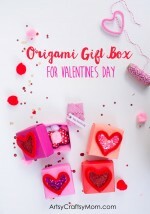 3 Simple Valentine Heart Card Ideas – love making cards, Then you’ll love these simple ideas to make one. Thumbprint Heart Bookmark – Perfect gifts for little ones to make for their friends. 3D Melted Crayon Heart Card – Reuse your old crayons to make this gorgeous card. 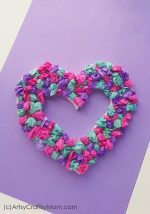 Crepe paper flowers – make Crepe paper roses to gift. Will never wither or fade. 3D Corrugated Sheet Quilled Flowers – Another gift for little kids to make for their valentine. So what did you make for valentine’s day? Do share with us in comments below ..
Wow Shruti.. that’s so simple and so pretty. Love it. 🙂 Thanks shama & OM. Its really easy. Hi, Nice one and easy one. Can you please let me know where can I get Dot Markers in India. I couldnt find it. Please help.